Music and Mayhem in 'Laurel Canyon' In the late 1960s, just as San Francisco was having its own Summer of Love, a rustic canyon at the heart of Los Angeles was also in bloom with songs that defined the moment, written and performed by the bands that defined a generation. 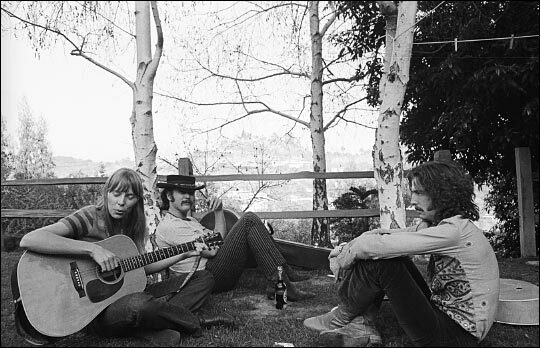 Joni Mitchell plays a song in Cass Elliot's Laurel Canyon backyard while David Crosby and Eric Clapton listen. Cass, a member of the Mamas and Papas, was known as the unofficial "queen of Laurel Canyon" and her home was a refuge for many musicians. 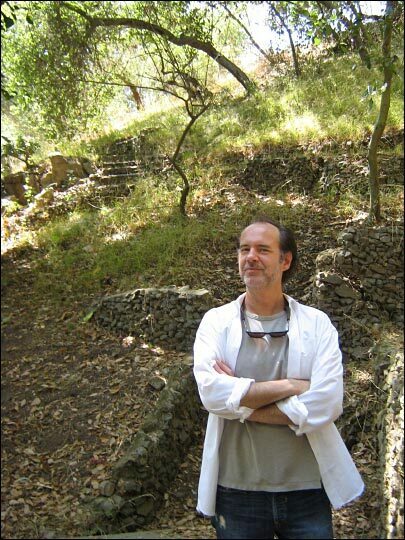 Michael Walker stands at the Laurel Canyon site where the legendary log cabin owned by Frank Zappa once stood. The home was the scene of many impromptu jams where some of the biggest names in music would drop by to play and party. The cabin burned down in 1981. In the late 1960s, just as San Francisco was having its own Summer of Love, a rustic canyon at the heart of Los Angeles was also in bloom with songs that defined the moment, written and performed by the bands that defined a generation. High above the city, the Byrds, the Mamas and the Papas, Frank Zappa, Crosby Stills and Nash, The Eagles, Jim Morrison and a host of other talents found a wild refuge just a short hitchhike from the noise and neon of the Sunset Strip. Laurel Canyon was home to entire bands, and the hangout of choice for every rock 'n' roll legend, or wannabe, who passed through Los Angeles. Michael Walker's nonfiction book Laurel Canyon: The Inside Story of Rock and Roll's Legendary Neighborhood charts the highs and lows of a celebrated part of music history. Walker has his own theory of why so many good musicians seemed to end up in the same part of a sprawling city: "Musicians need to breathe the same air," he says. "And these were some of the best musicians of their generation, sort of by luck and happenstance jammed into this beautiful, leafy, little neighborhood." 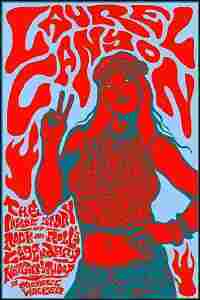 The innocence and wild creativity that characterized the "hippie" era of the Canyon slowly degenerated into an era of wild excess fueled by huge paychecks, cocaine and groupies. But for a brief decade, the canyon was an incubator for a "golden age" of popular music. In 1968 a British pop star and the refugees from two seminal Los Angeles bands gathered in a cottage on Lookout Mountain Avenue in Laurel Canyon, the slightly seedy, camp-like neighborhood of serpentine one-lane roads, precipitous hills, fragrant eucalyptus trees, and softly crumbling bungalows set down improbably in the middle of Los Angeles, and sang together for the first time. 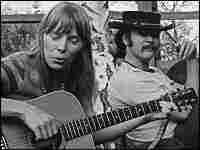 The occupant of the cottage, which had moldering shake shingles and draft-prone casement windows, was a Canadian painter, poet, and folksinger named Joni Mitchell. The British pop star, sporting a wisp of a goatee and a thick Manchester brogue, was Graham Nash, founding member of the Hollies. The refugees were Stephen Stills, late of the Buffalo Springfield, writer and singer of "For What It's Worth," who had three years before auditioned for the Monkees and, having failed, recommended his friend, a folkie named Peter Torkelson; and David Crosby, late of the Byrds and "Mr. Tambourine Man," possessed of a Buffalo Bill mustache, an immaculate harmony voice, and piercing eyes that Mitchell, with typical literary flourish, likened to star sapphires. (Crosby produced Mitchell's debut album, Song to a Seagull.) So it was that Nash, Stills, and Crosby sat in Mitchell's living room on Lookout Mountain, in the heart of Laurel Canyon, in the epicenter of L.A.'s nascent rock music industry, and for the first time, began to sing together. It is a measure of Laurel Canyon's mythmaking powers that this particular watershed may have actually occurred not at Mitchell's cottage -- though that's the way Nash and plenty of others remember it -- but a mile away in the living room of Cass Elliot of the Mamas and the Papas, who along with Mitchell briefly co-reigned as unofficial queen of the canyon, one an inscrutable poet-genius, the other a bosomy, meddling mother figure. What is certain is that within the year, Nash, Stills, and Crosby apotheosized into Crosby, Stills & Nash, the third group with Laurel Canyon roots within as many years -- after the Byrds and Buffalo Springfield -- to score a knockout with their first record. Nash moved into Mitchell's cottage on Lookout, there to write his ode to countercultural domestic bliss, "Our House." Mitchell, in turn, wrote and recorded "Ladies of the Canyon," her paean to the strange bohemian netherland where she and Nash nurtured their affair and where it would soon become evident that some of the twentieth century's most talented and enterprising young men and women had gathered at just the right moment. Laurel Canyon had been filling up with musicians from Los Angeles, New York, and London since the mid-1960s: Mitchell was a transplant from New York via Saskatoon; Carole King had recently decamped to a place on Appian Way; so had Nico, the Teutonic waif from Andy Warhol's Factory. Up the street from Mitchell's place were John Phillips, Michelle Phillips, and Denny Doherty of the Mamas and the Papas, who, until they moved west and recorded "California Dreamin'" and "Monday, Monday," had busked around as semi-obscure folksingers. British bands touring the States made it a point to stop by Laurel Canyon for a party or two -- Beatles, Stones, Animals, Yardbirds, and the rest. Some never left -- the British blues legend John Mayall bought a house just over the ridge from Mitchell's place. It was Brigadoon meets the Brill Building, and the repercussions thirty-odd years later continue to pour from radios, iPods, and concert stages around the world. Excerpted from Laurel Canyon by Michael Walker Copyright © 2006 by Michael Walker. 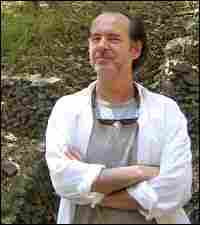 Published in May 2006 by Farrar, Straus and Giroux, LLC. All rights reserved.